While not the major lineup update one usually hopes for, Amazon's new Fire 7 and Fire HD 8 tablets do feature some welcome improvements as well as more colors to choose from. In addition, a Kids Edition variant of the Fire 8 HD is now available. Amazon has refreshed its line of Fire tablets today, updating the Fire 7 and Fire HD 8 with improved features and new vibrant colors, and adding a Kids Edition variant of the Fire HD 8 to its stock. The changes are not all easy to spot, but they are there. The most noticeable change is in the available colors—the Fire 7 and Fire HD 8 now come in Marine Blue, Punch Red, and Canary Yellow in addition to the standard black. Specific to the Fire 7 is a slight decrease in thickness and weight, and a display which features better contrast and text that is easier to read. According to Amazon, as a result of the display improvements, battery life on the Fire 7 gets a slight boost. The Fire HD 8 does not benefit from any bumps in screen quality or change in size, but it does enjoy a $10 drop in its price to $79.99. The Fire 7 does not get a price drop, unfortunately. Amazon's Kids Edition variant of the Fire 7 also gets a few touch-ups. Its onboard storage capacity is increased to 16 GB; in addition, it also features display and battery improvements. 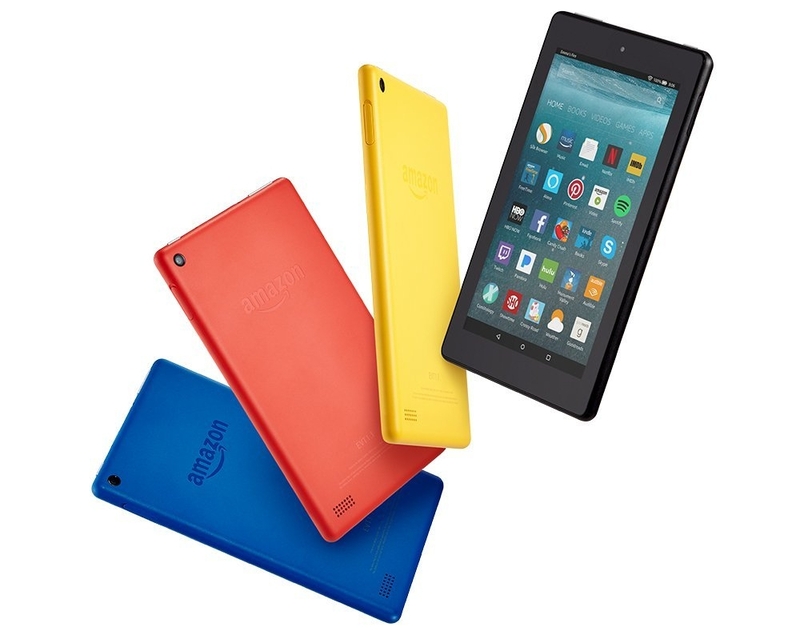 But the bigger news is the introduction of a new Fire HD 8 Kids Edition model which costs $129.99. Both Kids Edition tablets come with their signature protective cases as well as Amazon's 2-year, "no questions asked" guarantee that covers damage of any kind. Surprisingly (or perhaps not), the Fire HD 10 has been excluded from today's refresh; Amazon has made no mention of any upcoming updates to that device, although it plans to continue selling it for the time being. The updated Fire tablets, meanwhile, are not on sale yet; they will be available in a few weeks, on June 7.